Love this sofa. Comfortable and well made. Not an easy fabric far cats to scratch. Love the sofa set and chose charcoal gray so I can change out the deco pillows with turquoise, red, yellow etc. For a new look. The set is firm but very comfortable. Coming from a saggy, deep sofa it took a little time to get used to. However, microfiber is not a good idea if you have dogs. Lots of static cling. Overall the whole set looks and feel great. The appearance is very classic and material is smooth. Sofa provides cushion and support for my back. It is built well and the bottoms have a soft rubber so you won't mark up your floors if you have to move it. it is a beautiful sofa. Very durable and my grandkids jump all over it and you would never know! We got this sofa as a replacement for a totally different living room set that's no longer available. Despite being a different brand/color entirely the slate color goes well with our current set up (red/brown initially, now the brown is gone). The fabric is soft and smooth, and the cushions are the perfect balance for us between squishy and firm. We prefer a firmer cushion, which this is without being uncomfortable. The day we got it, our dog made a spot on cushion, which came right off with some dish soap and warm water, as we'd been instructed to do by the sales associate. So far we love this sofa, and we're hoping that it will last us longer than our other one did. Love, love the 3-piece set! Phenomenal comfort whether sitting or stretching out, So very easy to wipe away a stain (with 7 Grands, that's bound to happen). Thanks Colleen G. for showing us around and pinpointing this very attractive, affordable, comfortable seating package. 2 years ago, I bought one this sofa. My two cats tried to scratch the sofa and gave up. The material is not good for scratching. So last week I bought another one. 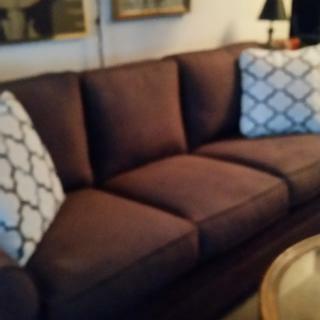 I recently purchased the Glendora Microfiber Sofa at Raymour and Flanagan. It is so comfortable! I have already taken a couple of naps on it. Slept like a baby. It blends in great with my other furniture, too. The saleswoman was great, too! She was very helpful and kind. I am very pleased with this purchase! The couch is very well made and the fabric is very durable. The price was fair as well. Looks awesome in my living room. The chairs goes well in my space it is comfy. The sales person was a great help. After 3 months, had to return sofa. Cushion stuffing penetrated thru coverings..small *wirey strings*..Another sofa delivered. Same issue after 4 months. The supporting seat springs have already sagged, and are pushing through the sofa bottom. DO NOT PURCHASE THIS SOFA! I just bought this furniture for my new apartment. I am absolutely in love! The softness of the microfiber is amazing. The pillows it comes with are adorable and cozy as well. The only downfall to a dark color for a couch is the light colored fuzz that shows. Otherwise, this was an amazing investment! I do not generally like "microfiber" material, but the material on this sofa is soft! I love the Slate color against the green wall color in my living room and the pillows even go well with the general decor in that room. We spent several months furniture shopping trying to find the right sofa and loveseat that would fit our living room and hold up to our family and guest. The salesperson at Raymore told us the cushions would hold up to our heavyset guest. Which they do not and are already showing heavy wear after only two months. We were told that the microfiber was easy to clean, which is true. But cat hair and dog drool is blatantly obvious and has to be cleaned daily. The furniture looks beautiful when clean, but requires a lot of effort to maintain. We’re very dissatisfied with what we were told and as a result avoid using this furniture as much as possible. We're sorry you feel this way. If you would please send your order and contact information to rfcare@raymourflanigan.com we'd love to see how we can help. I purchased the Glendora sofa and loveseat about a month ago. Prior to going to the store I made a list of what I was interested in. When I arrived the at the Glendora the salesman was very open about the sofa. He gave all the facts I asked for about the sofa. What I had read online about the sofa was only reiterated by the salesman, but he also made very clear that it was the right choice for exactly what I was looking for. It looks amazing, feels great and I'm super happy I purchased the Glendora. You will not be disappointed. I love my new Glendora sofa. I've had it a few weeks, and it has survived muddy paws and close calls! Easily wipe away dirt with a wet microfiber cloth. Love it! So happy with this purchase!! Originally visited the store to but a different living room set. Our sales person was just wonderful. She showed us to other sets. Never once trying to persuade me from what I wanted first. She was so patient, knowledgeable, and helpful. Finally we decided on this set, with coffee table and end table and we are very pleased. Now I need to find and accent chair or 2. Love this set! Very classy, yet comfy. The whole experience was great from picking it out to delivery. This sofa, loveseat and chair set is absolutely perfect in my family room. If you are looking for a comfortable sitting sofa with great support, this is it. The fact that all of the pillow covers are removable for washing is an added plus for those of us with pets. Stylish, great size for my home, great color. We are really enjoying our new look. Awesome sales associate, Pat M.
Love Love Love this sofa!! This sofa is beautiful, rich looking (slate), and comfy. The throw pillows that came with it are great looking. My husband and I are very happy with the decision taken to choose quality furniture and good price in Raymond & Flanigan. The excellent and very professional service from the representative who helped us during the course of this purchase. We recommend it. Love the color and size but most of all super comfy. Sofa is beautiful to look at and is very well built. It looks great in our living room next to the matching chair. I highly recommend this sofa. Great quality and comfort for the price. We are very happy with our purchase. OMG this couch! I sat on about 100 couches over a course of weeks - shopping, comparing and sitting. Honestly nothing compared to this couch. It was delivered this past Saturday by fantastic delivery personnel. I wish I could stay home from work and sit on it. It is soooo comfortable. I highly recommend this couch! So far we couldn't be happier with our purchase. From the salesperson to the delivery team it was a great experience. Love this couch. It is a great color (the dark gray), it is comfortable without being too soft and looks great in our house! Highly recommend, fit and finish is also very nice. We were looking at sofa's from another large dept store brand (we know her), but after a previous purchase and the quality they sold, I wanted to go with Raymour's line of furniture! We got both the couch and love seat and they are perfect! So comfy and durable and the Slate is a really great color! This sofa is so comfortable! Love the soft fabric and firm cushions. So happy with my purchase. The only thing I did not care for the throw pillows for my space. Using them in a guest room and found some I like better in my living room. We spent a lot of time looking at furniture and when I walked into the store this set stood out to me. Loved the look, the feel, the construction, the beauty...I was sold. It looks and feels even better in my livingroom! The whole process was easy from start to finish. The delivery team was prompt, efficient, friendly and done withing 15 minutes. They made sure I checked all the furniture out and then left with a smile and a "good day". went to raymour & Flanagan on cropsey ave in Brooklyn. Josephina was my salesgirl she was so sweet and helpful. The best part of my experience was that they did not push me to buy. I sat on every couch in the showroom and still no pushing. I give them a five star rating. It’s been so long since we’ve purchased new furniture. We decided to go to Raymour and Flanigan since we have friends that purchased there in the past. This collection was perfect for our lifestyle. The color blended beautifully and the style was so comfortable. From the point of sale to delivery, it was so smooth. Purchased on Sunday, delivery Wednesday. We will highly recommend shopping at your Newington Ct store. Thank you! This sofa gave the room the updated modern look I was looking for. The color matches perfectly with the color of the living room. The microfiber feels nice and is very comfortable to sit on. The delivery was on time and they put together everything together where we wanted it. Thanks to the sales person also for going above and beyond with helping us pick the right sofa. I bought the sofa and chair in slate and luv them. The material seems very durable and it is comfortable. I am going to order the ottoman which I feel will double as a coffee table. My only complaint is the horrible throw pillows, which I immediately replaced. I highly recommend. We've had this sofa (and the matching love seat) for a week and love them so far. Very sturdy feel, but also very comfortable. The color is perfect. It has the feel of furniture that's going to last a long time so I hope I'm right! I have only had the set for 2 days but love the way it looks in our living room. Cushions need to be broken in and I am sure that won't take long still comfortable. The color was right on. I love the color and construction. It is very sturdy and comfortable. The pillows are a nice a accent. The sofa is comfortable and good looking. The perfect accent the room. Love the good quality cushions and the soft upholstery. Its not too soft. I got the dark grey couch and looks great in my living room. So much to choose from. Sales woman was very helpful.Let us take our time. I made the right decision. Love my new couch. love it & love the color. Looks great in my apartment.& very comfortable! Love my new living room! We love Raymour & Flanigan furniture. We don't go anywhere else. When it was time to get new living room furniture after 10 years, we knew Raymour & Flanigan would have what we were looking for. This couch is amazing. Looks Great! Nice and firm (our old one had absolutely no support left for 10 years of using it). Jack was our salesman at the Watchung, NJ store. He was EXCELLENT! I highly recommend! This couch is very high quality and looks exactly as it does pictured. Easiest and quickest purchase i have ever made. Delivery was a breeze. Love my set. Comfort and great quality for a reasonable price. Are the back pillows attached? BEST ANSWER: All cushions on the Glendora sofa are removable and reversible. How is it with cat hair? BEST ANSWER: Microfiber is a very tightly woven fabric of 100% polyester which is very durable and easy to care for. Pet hair will sit on top of the fabric and can easily be vacuumed. People are saying they purchased charcoal as a color but don't see it listed as a choice.Does it go by another name? BEST ANSWER: There is not an option for charcoal as an upholstery option. The reference is likely to the color slate. what size doorway is needed for delivery for Glendora sofa? BEST ANSWER: A recommended door width for the Glendora Microfiber Sofa is 30". The frame without the pillows is 30" and the feet are also removable. Can you order additional seat cushions and what would be the cost? BEST ANSWER: Hello Marcia! If you are looking to get replacement cushions, please contact our customer care department 866.383.4484, option 7. We would be happy to help you! Are you having issues with the cushions? Thats what I'm nervous about. is there a smaller apartment size love seat and sofa? BEST ANSWER: There are Glendora Microfiber Loveseats for purchase that have the following dimensions: L: 75" x W: 37.5" x H: 37" However, the sofa itself only comes in the dimensions shown on the website. Please call 866-383-4484 option 2 for assistance. 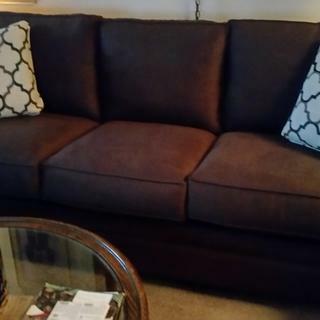 I ordered a fabric color swatch for this sofa, the swatch color is close to a light Cranberry color, however the color name says Cardinal and the picture on line is very red...which us more accurate the swatch or the name and color on line? BEST ANSWER: We do our best to photograph the furniture to look as true to life as possible, however differences in computer monitor settings and lighting can sometimes make it difficult to determine the actual color. The swatch is an accurate representation of the color. Will this material stand up to a dog? BEST ANSWER: Yes, I've had my couch & love seat for over a year and my English Bulldog Monty loves it! It cleans up well with a vacuum & damp cloth. Sometimes I cover them with a blanket to keep the hair off which helps. How is it holding up? I just purchased the set and have a dog, 2 cats and kids... Hoping it lasts. The couch & love seat are still in like- new condition.They are vacuumed & cleaned weekly and come out looking great.I do cover them with a blanket because my bulldog loves laying on them. The fabric seems very sturdy. We don’t let our dog on the couch, but the material is holding up well with lots of use. It doubled as an extra bed a few times. We have a dog and her hair comes off easily using a dryer sheet. She doesn't lay on the couch but is always leaning against it. Do the cushions stay in place? BEST ANSWER: We have had no issues at all with the cushions not staying place. The sofa does not get used more than once a week, but never a problem. We are very pleased with it. Hope that helps. Yes! This is the first couch I got as a home owner and I wouldn’t trade it for any couch on earth. Cushions stay in place, are super comfortable, and easy to clean. Had anyone had this for over a year with pets and kids around the ages of 10 & 11? 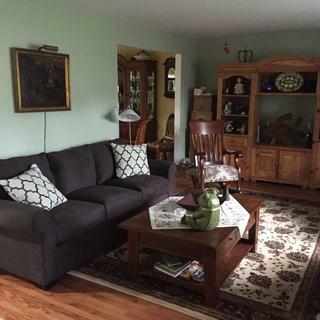 If so can you tell me if the sofa and loveseat holds up and will last? BEST ANSWER: I have had the sofa for just over a year. My kids are grown, but I have a dog. We try to have a blanket on it for her to lay on but that doesn’t always work. So far the sofa has held up well and still looks great! I have no pets. My children are all grown. I do have a 6 and 7 year old here very often and the sofa gets a real beating and it is still in good shape. Yes, we have had this sofa for over a year with a dog, no kids. You can't tell it has been used every day. We feel it is wearing very well. only have a cat and she loves sleeping on it. It is holding up very well. What size are the accent throw pillows? BEST ANSWER: I think 18"x18" or appears exactly as in the picture. Hello, are the seat & back cushion covers removable? Thanks. BEST ANSWER: Yes they are both reversible and interchangeable. Yes the back and seat cushions are removable. Does this microfiber sofa have static? I haven't experienced any static. Is there Velcro under the cushions to hold them in place? BEST ANSWER: The Glendora Microfiber Sofa is made in Mississippi.